the same time we appreciate how valuable your time is so this year we introduce a redesigned MasterTag Catalogue that we hope you will find quicker and easier to use. We have now arranged the catalogue in sections according to label type, each section sorted alphabetically for easy reference. Once again we are able to supply a Master Tag for every seed and seed-raised product offered by Ball Colegrave in their Seed, Plant and Vegetable catalogues. 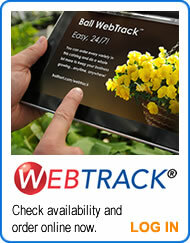 We have created separated MasterTag listings for the Ornamentals and the Herbs & Vegetables for even quicker reference. During the course of our next print run we will be reviewing and updating the increasingly important Herb and Vegetable Tags to provide more specific information for consumer success. The Cell Tags are now listed separately, are easier to reference and mainly being generic are available to cover all the major bedding and patio species. As always our dedicated team are waiting to take your order and advise you with regard to all your label requirements. Also, check out our Sales Lister with Exceptional Clearance Prices!